Drones bearing piping hot burritos are about to start swooping down on the Australian countryside. 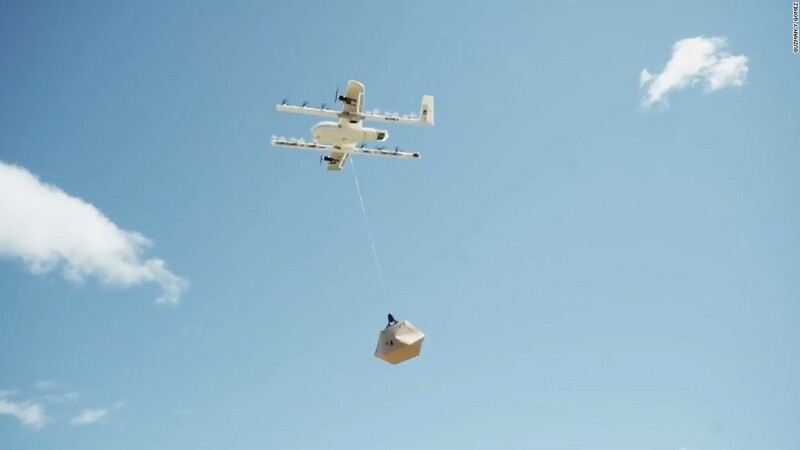 At least, that's the plan for Google affiliate Project Wing, which on Tuesday announced new tests of its drone delivery service with two Australian businesses, a Mexican taqueria chain and a drugstore company. It's not the first time the Project Wing team has used drones to send people burritos. It did that last year with Chipotle at Virginia Tech University, but that was "in an open field, not to a specific address or location," said James Ryan Burgess, one of Project Wing's managers. The Australian tests are taking place in a rural community near Canberra, the national capital, where residents "face a 40-minute round trip in the car for almost anything, whether it's a carton of milk, veggies for dinner, or a cup of coffee," Burgess said in a company blog post. Flying goods right into their yards is a great deal more complicated than navigating a field at Virginia Tech. "With each delivery, we encounter a new yard space with its own layout of trees, sheds, fences, and power lines," Burgess wrote. The issues range from programming the devices to maneuver safely around obstacles like parked cars or outdoor furniture to following customers' wishes to set down perishable food items close to their kitchens. Delivering to a backyard in rural Australia. By bringing in Mexican food chain Guzman y Gomez and drugstore company Chemist Warehouse, Project Wing is adding to the challenges. Its ordering and delivery system will need to handle hot food from Guzman y Gomez and retail goods of all different shapes and sizes from Chemist Warehouse's extensive catalog of products. "The information we gather from both of these test partners will help us build a system so that merchants of all kinds can focus on what they're good at — like making food or helping people feel healthier — rather than being distracted by complex delivery logistics," Burgess said. Project Wing is the drone delivery unit working out of X, Google (GOOGL) parent Alphabet's so-called "moonshot factory" that explores emerging technologies. 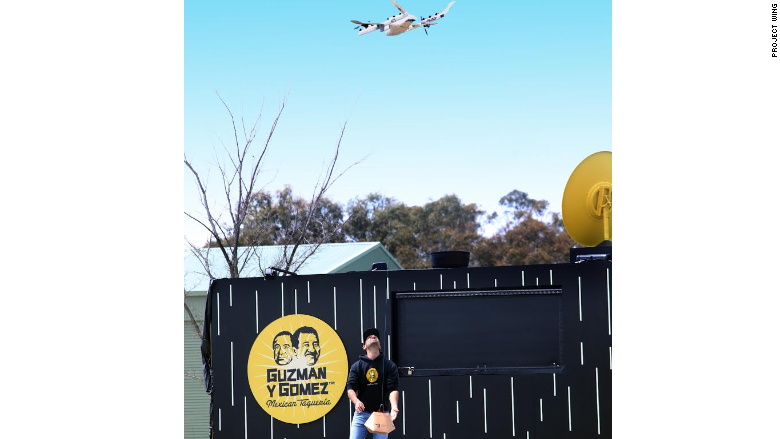 A Guzman y Gomez employee loading a burrito package onto a drone. 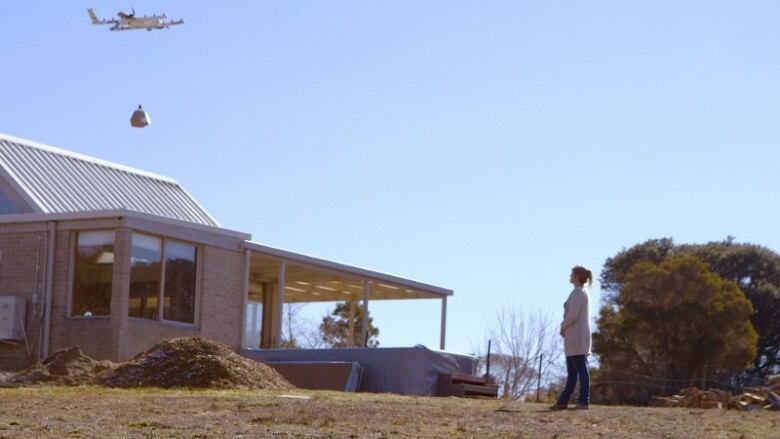 Its endeavors in Australia are the latest move in the drone delivery race heating up among big brands. Last year, Domino's announced it would start using the devices to drop pizza off to customers in New Zealand. Amazon (AMZN) pulled off its first drone delivery in the U.K. last December with an Amazon Fire device and a bag of popcorn. And innovative drone initiatives are also in the works in Rwanda, Tanzania and Reykjavik in Iceland. -- Matt McFarland contributed to this report.